Applications, and Windows itself, need to know the proper program to use when sending mail - we'll look at where that is, and how to [re]set it. To begin with, I'm guessing that you do, indeed, have at least one more email client than just Thunderbird on your machine. Since you mention that you have Office, then it's likely that you also have Outlook, the email program that is part of Office. Since you're getting asked about Exchange, that tends to support that assumption, since Outlook is one of only a handful of email programs that even know about Exchange. "Since you mention that you have Office, then it's likely that you also have Outlook ..."
Nope, the problem here is that somehow your default email program got reset. Often this might be due to an update to Office - perhaps downloading the latest patches, or performing a repair install. Or something else unrelated. It happens. And if this is the problem, it's fairly easy to fix. The dialog should include your currently installed email programs. My desktop, for example, includes the options shown above plus both Microsoft Office Outlook and Mozilla Thunderbird. How do I change the "mailto:" or default mail program? 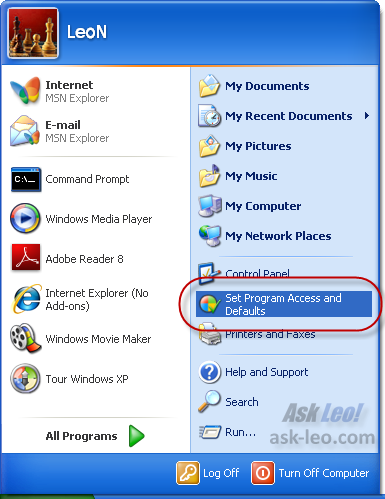 The 'mailto:' or default mail program is a concept maintained by Windows and changed using Internet Explorer. Usually. We examine how to change the default mail program to a couple of popular services. 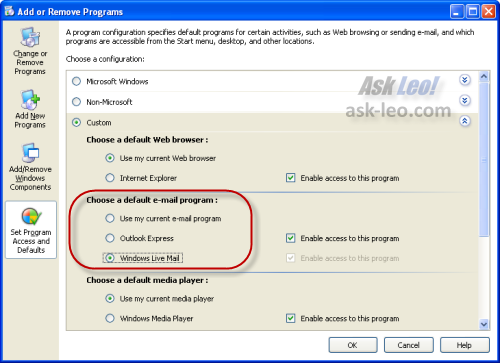 What's the difference between using Outlook Express versus my ISP's email? Email programs, email access and email servers are all frequently confusing to many people. We'll review where email goes, and how you can get at it. Microsoft is infamous for changing your defaults after updates. Every once in a while ma browser default gets reset to iexplore, MediaPlayer gets put on my quick launch menu. It's there feeble attempt to get you to use their programs. Microsoft is more afraid of free software than of MacOS and other commercial software. Steve Balmer once commented that it's better for M$ if people pirate WIndows than use Linux. It's like a drug pusher starting out offering free drugs. But how can I set gmail as my email client? 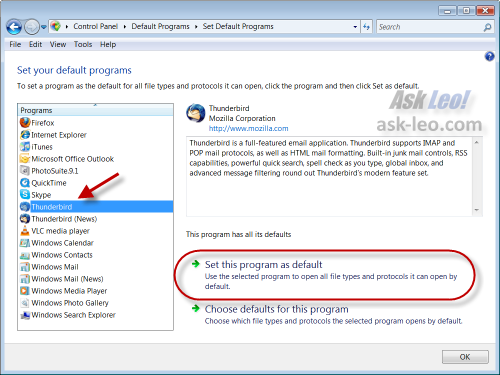 This article includes an approach: How do I change the "mailto:" or default mail program?